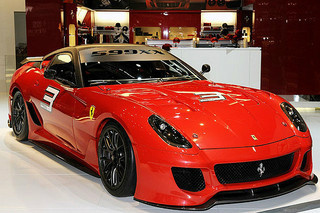 The 599XX sports car was launched by Ferrari at the 2009 Geneva Motor Show as a limited edition racer of only 29 cars. 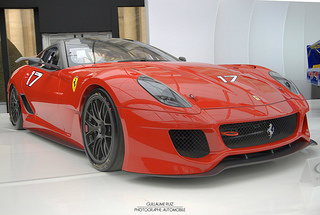 Very much based on the 599 GTB, it was designed exclusively for the track. Handling was managed by the inclusion of the SCM suspension system, and there was a screen in the cockpit which displayed the ongoing status of all activities relating to the car's performance. There was extensive use of carbon fibre in the body, whilst the brake pads were made from lightweight composite material which improved brake efficiency. The aerodynamics were further refined to produce 280 kg of down force at 124 mph, and 630 kg at 186 mph. Not surprisingly, the Ferrari 599XX carried a hefty price tag of $1.5 million. The 599XX was powered by a 6 litre, V12 engine in which output had been boosted to 720 bhp, at an astonishing 9000 rpm, and 506 ft/lbs of torque at 6500 rpm. Linked to an F1-style Superfast six speed automatic gearbox which was capable of changing gears in as little as 60 milliseconds, this produced a top speed of 211 mph, coupled with a fantastic 0-60 mph time of 2.9 secs. Much of this additional performance had been achieved by reducing the weight of key engine components, including use of a new crankshaft. 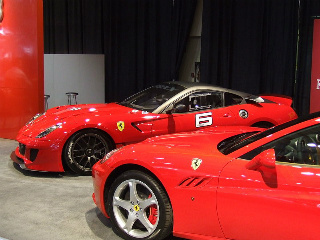 On the second hand market, since there were only 29 units of the 599XX built, then this would be reflected in the price. An excellent example of this Ferrari sold at auction for almost $1.25 million.